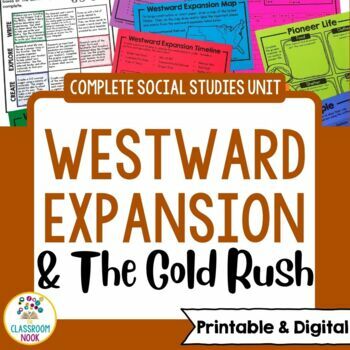 Engage your students in learning about life in the 1800's during the Westward Expansion unit using this ready-to-go complete unit! Students will work in small groups, individually, and as a whole class to learn important concepts on the Westward Expansion movement. What was Westward Expansion and when did it occur? Detailed Teacher Guide with everything you need for each lesson. All needed resources are downloadable directly from the guide making prep a breeze! The teacher guide includes a unit overview and detailed daily lesson plans. 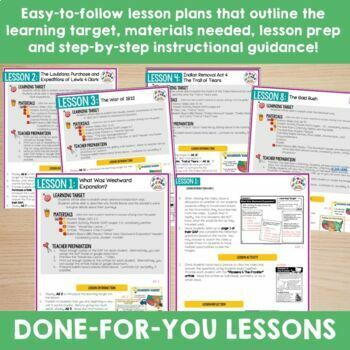 The lesson plans include easy-to-follow information about student objectives, materials needed, teacher preparation required, and the steps on how to conduct the lesson. You'll even find sample anchor charts and answer keys embedded right into the teacher guide. 37 anchor slides to go along with each lesson. 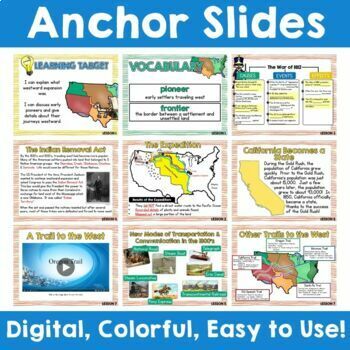 This anchor lessons are provided in PowerPoint, PDF, and PNG image files to meet your needs. Take a look at the extensive sample to get a sneak peek of the unit! Let me know if you have any questions! Thanks! !